Hot on the heels of Kodak's DCS520 (Chip Shop April 1998) comes the DCS315 at less than half the price - £4,990 including lens, PCMCIA storage card and other essential accessories. 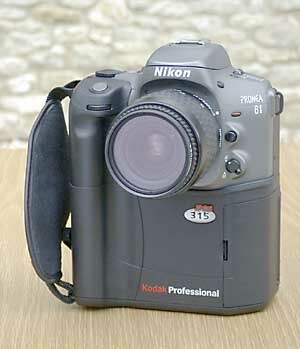 The Kodak Professional DCS315 is housed in a Nikon Pronea 600i APS SLR body and replaces the DCS410, a de-featured version of the DCS420 which was itself replaced by the DCS520. 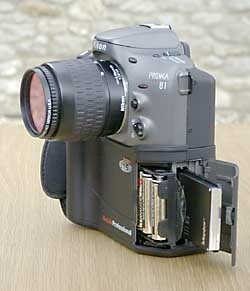 Few professionals are likely to have heard of the Nikon Pronea 600i, Nikon's first APS SLR introduced in 1997. In itself this could hardly be considered to be a professional camera, though it does have the ability to take their standard 35mm Nikon F mount lenses and has a small built-in pop-up flash. However, it is likely to appeal to professionals more than most of the quirky integral lens cameras with which the digital market is now saturated. When packed with all Kodak's advanced digital stuff it certainly does become a serious professional instrument. In my review of the DCS520 I suggested that Kodak should put their CCD chip into a Canon APS body, where it would almost fill the 30.2 x 16.7mm frame area. In the event, Kodak chose a Nikon APS but never mind, this will appeal to many Nikon users who want a digital camera. The lightweight 24 - 70mm lens somehow seemed unlike a real Nikkor in solid quality but the bigger disappointment was when I put the viewfinder to my eye and saw the postage stamp frame outline in the middle of the screen. To make matters worse, this effectively gives our beloved Nikkors a 2.6x range extension - great if you like long tele lenses, not so good if you want wideangles. IX-type Nikkors for the APS SLRs have a 1.7x factor. Seven year ago - even four when the DCS420 came out - this was an understandable limitation but it's now time for a solution. New viewfinder optics - a magnifier - could mask this drawback: it really is difficult to peer at a much reduced viewfinder image. One alternative is the use of relay optics, but these necessitate specially designed bulky camera bodies and have other problems. The best solution is a CCD which covers the whole film plane. Philips now have a 24 x 36mm CCD. Watch this space. Many of the 'compact type' digital cameras have optical viewfinders which give only approximate indications of the field of view. We do not expect this in a professional camera. It was not until I noticed that parts of my images were missing from the acquired images that I became suspicious. Surely my framing was not this bad? 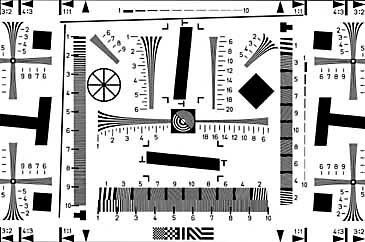 I carefully photographed the new ISO Resolution Charts for Electronic Still Cameras. Along the bottom of the frame, the viewfinder showed very slightly less than the CCD records. On the right of the frame, it showed very slightly more than recorded. Both these are reasonably accurate. But on the left and at the top of frame the viewfinder showed much more than the CCD recorded - a big error and enough to cause concern to any professional. ISO Resolution Chart as framed in the viewfinder. The ISO Resolution Chart as recorded by the camera. CCD pixels are expensive, so accurate viewfinders are essential. We do not want viewfinders which show much less than they record because cropping to get back to our intended framing wastes these valuable pixels. 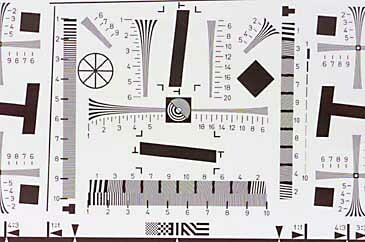 But viewfinders which show more than the CCD actually records are a liability. This error must be corrected without delay in a professional digital camera. In the meantime, I advise you to test viewfinder accuracy carefully before buying. Despite these criticisms, my overall impression of the DCS315 is one of Kodak's usual well-designed high quality. Apart from the ability to capture images in a 1520 x 1008 pixel (four pixels smaller in each direction than the DCS420) proprietary TIFF format, to be processed during acquisition, the camera has the new ability to process images on-board and save them as JPEGs with three options for image sizes. In fact the DCS315 could be called a 'computer with lens' for it contains a Motorola 821 PowerPC chip to carry out on-board processing. There is no option to save in Kodak's FlashPix format, though. Size isn't everything when it comes to pixel count. As a true 1.5 megapixel device the DCS315 is no slouch but apparent resolution of images is also greatly affected by processing and compression. The DCS315 images look very clean when acquired as TIFFs but do show some slight signs of colour aliasing. There is also some blue noise, as with the DCS410/420 which used the same chip - somehow more noticeable since the advent of the DCS520 with its use of Indium Tin Oxide (ITO) to give much improved blue performance. The DCS520 costs twice as much but you get what you pay for. As JPEGs, the images show some slight signs of compression artifacts in return for a compression ratio of about fifteen to one but JPEG is a most welcome option which helps pack many more images onto the PCMCIA card. The images may opened directly into an application, without the need for additional processing. 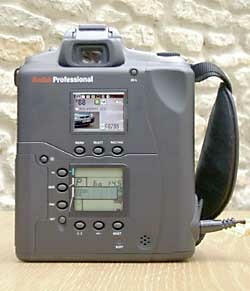 As on the DCS520, a colour LCD panel with histogram on the rear of the camera allows post-capture checking of exposure and confirmation that the shot has been stored. A second monochrome LCD is for the Nikon camera settings. With many of the cheaper megapixel-plus digital cameras the time spent waiting between exposures is long - as much as fifteen seconds. The DCS315 will capture a respectable three images in one and a half seconds, before having to take a storage 'breather'. This alone is worth the 'professional' tag. ISO range is 100 - 400. No batteries are supplied with the camera, though the good news is that six standard AA batteries are used, carried in a special tray. This makes battery changing easy, quick and inexpensive. Nickel Metal Hydride (NiMH) batteries can now be obtained in ratings of 1200 or 1300mAh - twice the capacity of Nickel Cadmium - but note that they do require a special charger. Like its big-brother DCS520, the '315 has FireWire output, for ultra-rapid acquisition of images. This is no problem in the studio, where FireWire cards may be fitted into desktop computers but the only laptops which have FireWire built-in are the neat new VAIO ('Video Audio In Out') range from Sony. Of course, most laptops have PCMCIA card readers built-in, so it's a simple job to take the card out of the camera and pop it into a laptop. Kodak should be congratulated on adopting FireWire, though they must be quite disappointed that the inventors, Apple Computer, have not yet implemented it in their Macs-hines. The basic camera costs £3,995 but the only supplied accessories are a hand strap, extra battery tray and 52mm Hot Metal filter. The chip in the DCS315 has hightened infrared sensitivity and the Hot Mirror reflects most infrared light, especially between 800 and 1200 nanometers, to offset this. It's a drag having to change the filter to your other lenses and additional Hot Mirror filters are expensive: the 77mm filter required for the 80 - 200 zoom is US$139.95 at B&H Photo in New York. It would be at least £100 here in the UK. A virtually essential accessory pack containing a PCMCIA hard drive PC card, 24 - 70mm Nikon IX lens, AC power adapter, universal adapter plug kit, extra battery tray and FireWire cable costs £995, bringing the total price up to £4,990. The DCS315 is well positioned as an entry-level professional digital camera with good 1.5 megapixel chip. 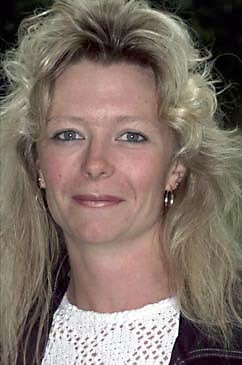 But other cameras now offer pictures which approach its quality for a fraction of the cost - if not with the same degree of professional control. My pictures of the DCS315 were taken with such a camera, to be released at Photokina, about which I am not yet permitted to speak but which will probably cost in the region of £595 - £795. The DCS315 uses a well-established CCD. It should be easier to obtain than - and costs less than half the price of - the DCS520. You'll enjoy using it. 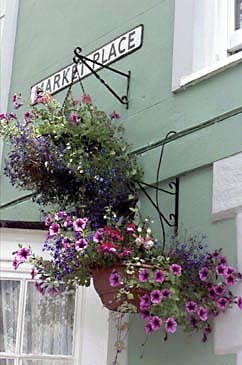 This article first appeared in "John Henshall's Chip Shop", July/August 1998.